District Vector-Borne Diseases Control Officer Dr. Chidambara, District Health Officer (DHO) Dr. Basavaraju, former Mayor T.B. 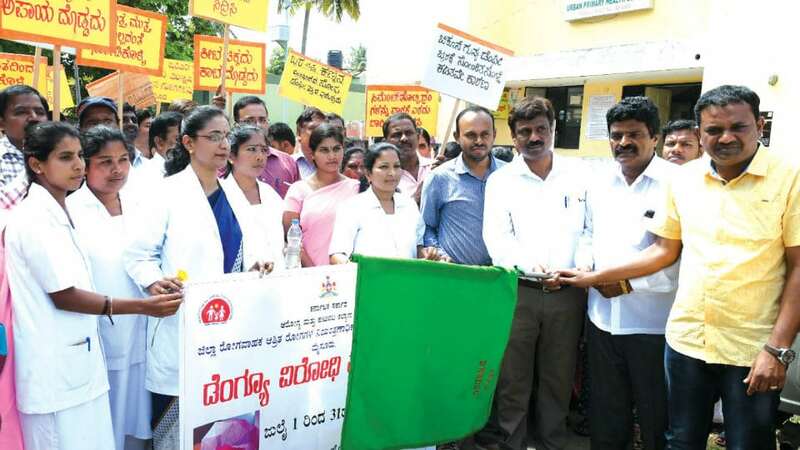 Chikkanna and Corporator Jagadeesh are seen flagging off an awareness rally on ‘Dengue prevention’ from the Urban Primary Health Centre (UPHC) premises in Thonachikoppal here this morning. The medical, para-medical and other staff of the UPHC, carrying placards with messages on preventing and controlling the spread of Dengue and other diseases, were part of the rally that was organised by the Department of Heath and Family Welfare and District Vector-Borne Diseases Control Officer’s office as part of Dengue Prevention Month.